To the east of Cahors, on the border of the Lot region, you'll find this lovely home, which is the perfect place for a wonderful holiday. There's a wide range of sights and activities nearby, including the rocks of Saint-Cirq-Lapopie, the Thursday market in Villefranche de Rouergue and the cities of Toulouse and Montauban aren't too far away either. Follow the river Lot as it meanders through the landscape, taking you along the most beautiful spots. 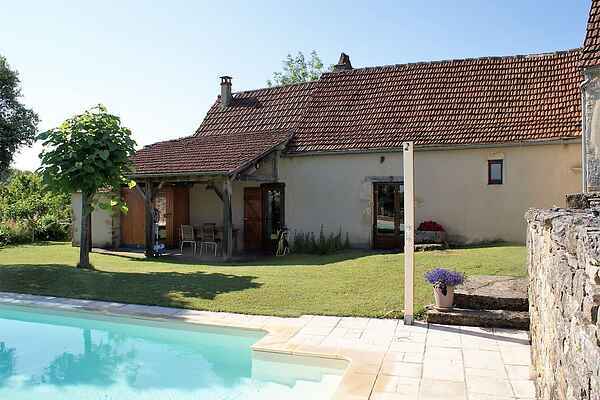 Your holiday home is situated on the edge of a small, typical French village. The 'boulanger' is within walking distance, perfect for getting your fresh croissants and 'pain au chocolat' for breakfast. There's a spacious sleeping area where you'll find all four beds and there's a bathroom, living room with dining area and a well-equipped kitchen. The outdoor area incorporates a spacious garden, a wonderful saltwater swimming pool and a sun terrace with loungers. There's an additional, covered terrace right outside the house, which is a great place to spend the evenings. During the summer months, there are many festivals and village fetes in the area. The food markets in particular, are great - sit down at one of the long dining tables and try some of the local specialities. Cahors is also a well-known wine region, so don't miss the opportunity to visit a local winery. Other activities include cycling, walking, canoeing and horseback riding.